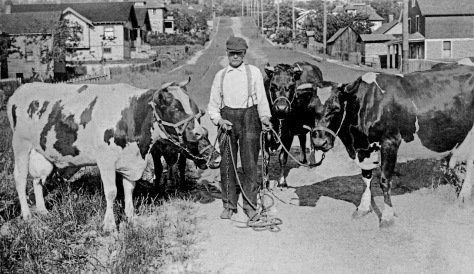 THEN: Ballard dairy farmer Jess Jensen poses with four of his milch cows on 8th Avenue Northwest, near its intersection with NW 58th Street. The subject looks north. 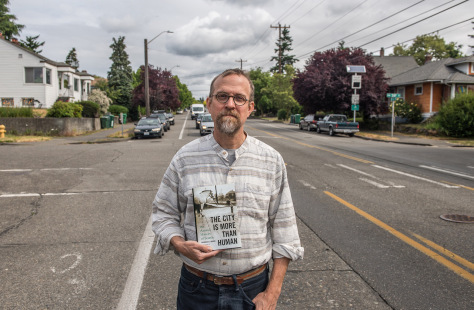 NOW: Holding his book “The City Is More Than Human,” historian Frederick L. Brown, poses for Jean Sherrard in the traffic on 8th Avenue NW. Brown only seems to be in danger. The cars behind him have been stopped by the traffic light at NW 58th Street.